CNC Control installation available Worldwide, CNC parts,service and training. CENTROID CNC Retrofit Installation, on site CNC service installation worldwide. CENTROID offers on site CNC retrofit installation worldwide. With our experience working for you, your machine will be back up and making chips in no time. 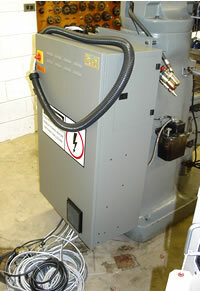 Factory Trained CENTROID CNC technicians are available for Retrofit installation and Training right in your shop! With our pro installation you know its going to be a big success. We take care of the install and make sure everything is right and we teach you how to program and operate the control to make the parts you need. With your local Tech Rep helping you, you know you'll always have personal service and support for your upgraded machine. Typical on-site installation time for a knee mill or a bed mill takes two or three days a more complicated VMC or Horizontal takes a week to two weeks depending on the machine.. Our retrofit experience will save you time and money. We even have controls designed with specific machine make and model related features built-in. With our specially configured controls these retrofits are a easy bolt up and minimize on-site installation time. With a CNC Service installed, Centroid factory assembled CNC, you know that you are getting a quality retrofit. 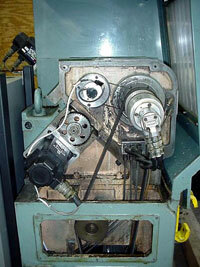 Retaining Existing Accessories: It is a good idea to start a retrofit with a completely intact NC/CNC machine. The Centroid CNC retrofit will typically replace all existing electronics and axis motors. Great savings can be realized by reusing any existing hardware that is in good condition. Servo Motor Installation: On some retrofits the axis motors are a direct bolt up and even use all of the original hardware. 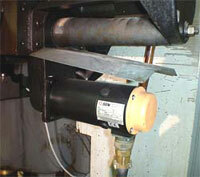 Here is an example of a direct bolt up with a proper drip shield. A CENTROID retrofit usually makes use of existing axis drive belts and pulleys, axis motor couplers, limit and home switches, air brake cylinders and solenoids, lube pumps, flood pumps, conduit, and other original equipment right down to the nuts and bolts. Often, most original accessories can be retained and made operational again with a Centroid retrofit. Commonly reused examples are: an auto lube pump with low lube level detection, an air motor controlled spindle speed up/dn drive, and a original Y axis + and - limit switch.